Anxiety has been identified as a cardiac risk factor. However, less is known about the impact of generalized anxiety disorder (GAD) on prehospital delay during an acute myocardial infarction (AMI). This study assessed the impact of GAD on prehospital delay and delay related cognition and behavior. 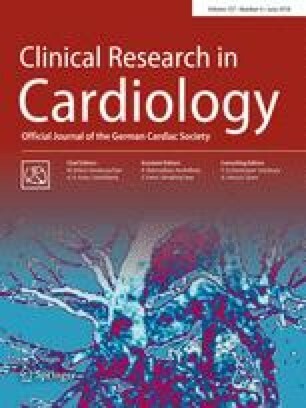 Data were from the cross-sectional Munich examination of delay in patients experiencing acute myocardial infarction (MEDEA) study with a total of 619 ST-elevated myocardial infarction (STEMI) patients. Data on socio-demographic, clinical and psycho-behavioral characteristics were collected at bedside. The outcome was assessed with the Generalized Anxiety Disorder scale (GAD-7). A GAD-7 score greater than or equal to 10 indicates general anxiety disorder. A total of 11.47% (n = 71) MI patients suffered from GAD. GAD was associated with decreased odds of delay compared to patients without GAD (OR 0.58, 95% CI 0.35–0.96), which was more significant in women (112 vs. 238 min, p = 0.02) than in men (150 vs. 198 min, p = 0.38). GAD was highly correlated with acute anxiety (p = 0.004) and fear of death (p = 0.005). Nevertheless, the effect remained significant after controlling for these two covariates. GAD patients were more likely to perceive a higher cardiovascular risk (OR 2.56, 95% CI 1.37–4.76) in 6 months before MI, which leads to the higher likelihood of making self-decision to go to the hospital (OR 2.68, 95% CI 1.48–4.85) in the acute phase. However, GAD was also highly associated with impaired psychological well-being, stress and fatigue (p < 0.0001). In AMI patients, GAD was independently associated with less prehospital delay, but led to an impaired psychological state. X.Y. Fang and D. Spieler shared the first authorship. Cooperating clinics in the city of Munich (Germany): Klinikum-Augustinum (Prof. Dr. Michael Block), Klinikum-Bogenhausen (Prof.Dr. Ellen Hoffmann), Deutsche-Herz-Zentrum München (Prof. Dr.Heribert Schunkert), Klinikum-Harlaching (Prof. Dr. Harald Kühl), Universitäts-Klinikum der LMU-Innenstadt (Prof. Dr. Axil Bauer), Klinikum-Neuperlach (Prof. Dr. Harald Mudra), Universitäts-Klinikum Rechts der Isar-der-TUM (Prof. Dr. Karl-Ludwig Laugwitz) and Klinikum-Schwabing (Prof. Dr. Stefan Sack). Our work was supported by a research grant from the Deutsche Herzstiftung (8810002296) (to Prof. Dr. KH Ladwig). This investigation was realized under the umbrella of the Munich Heart Alliance (MHA). All patients were informed of the aim and procedures of the study and also that taking part in the study would have no effect on their treatment. All patients were required to sign a declaration of consent. Details that might disclose the identity of the subjects under study has been omitted.